It has been quite some time I posted on the blog. Last year I had the crazy idea to be an exhibitor on the largest LEGO show in Germany. My very first exhibition. It was a crazy ride, I run out of time for lot of my plans, but at the end I managed to find workarounds and had a nice digital train layout. It was a great experience. I will soon write a separate post about it. I put everything in for the show, worked day and night to be ready. Didn't have much time for blog writing. Afterwards I kind of got a LEGO overdose. The holidays were coming and I focused on other aspects of my life. Now my LEGO passion is starting to come back and I'm focusing on the tasks ahead. At moment I don't plan to go on another exhibition anytime soon, but focus on a home LEGO train layout with all the advanced features I had in mind last year. I'm also planning to write more detailed posts about my progress. 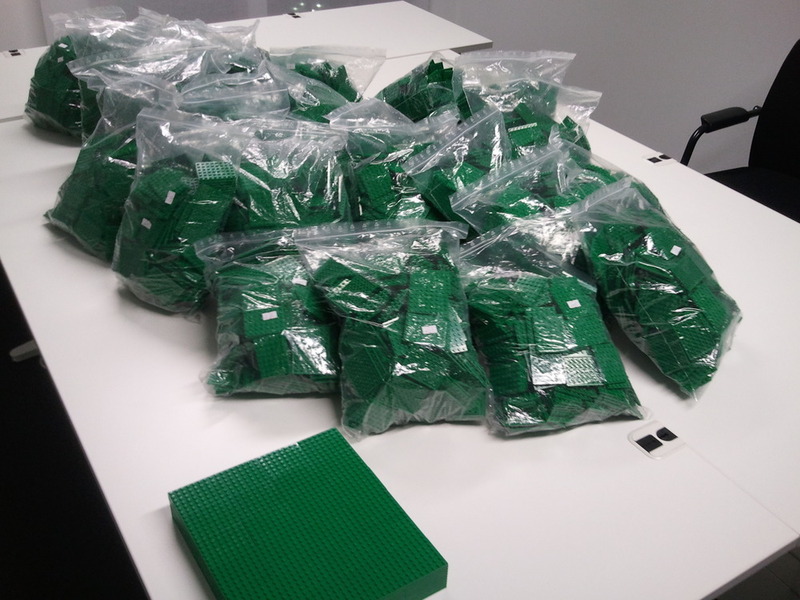 On Friday I received my BrickLink order of 6 x 8 green plates. The price was low compared to other types of plates and it was essential for my modular layout plans. Now that I have plates I started doing more experiments with modular tracks on the weekend. I'm still missing the parts for track bedding and my technic bricks are limited for the bottom modular connections, but hopefully these parts are not uncommon, so it won't depend on one single BrickLink order. I also finished motorizing the train switch, so now I can go order the parts for 30 switch remote controllers. As you can see in the middle I also tested adding a normal green 32 x 32 baseplate using two faced tape to secure the bottom technic bricks. It worked quite well the height almost perfectly matches the other modular blocks. The only difference is the green plastic shininess. The baseplate doesn't refelect light as much as the 6 x 8 plates. Here you can see my uphill experiment with tan colored bricks. The problem is to find the good of slope degree which can be still kept as a 16 x 16 horizontal sized unit and to making sure the modules can be still connected without gaps. I finished the weekend with building one tower from the LEGO Tower Bridge set (10214). Next task is to modify the building design to fit more into a minifig scaled world. Windows and balcony must be enlarged and possibly one floor removed. The rooftop looks good already. For my train layout plans I'll need much more buildings. This week I built a Fire Brigade (10197) another Pet Shop (10218) and a Grand Emporium (10211). Town hall (10224) is coming soon and we will see if I can get the parts for the discontinued Cafe Corner (10182) on BrickLink. I also bought discounted Tower Bridge (10214) at Amazon. The plan is to transform the towers to a building with modular house scaling. I'm planning my first big train layout for my living room floor. This project will still takes many weeks. Here is the first layout plan made with BlueBrick. The goal is to have many tracks to utilize the computer controlled trains. Example every switch needs to be remote controllable. It's an ambitious plan pushing the limit of my living room size. We will see how much compromise I will have to make on the road. I already have the track parts required for such a layout. In the middle and top I also made some free space for the modular buildings. On the right a long elevated two track bridge is planned.